‘Ashton; Imported, Made By Hand’ declares the box and band of the Ashton Classic Double Magnum. If you look closely, the box also shows its origins in the Dominican Republic, and the marks of the Fuente Family’s work. Indeed, the Ashton cigar brand is a Fuente brand, manufactured at their facility in the Dominican Republic, by hand. The line was born of a discussion between Carlos Fuente Sr. and a man named Robert Levin. For those of you who are fellow brothers of the leaf, the name Carlos Fuente Sr. is well-known; the son of company founder Arturo Fuente who took his father’s company to new heights. Robert Levin’s name may be less known; the son of a tobacconist, he took on his father’s business. Robert approached Carlos Fuente Sr. with a dream. That dream was a cigar that was approachable and yet complex, something flavorful that his customers would love. Carlos Fuente Sr. helped to make that a reality, providing his immense knowledge of Dominican tobacco to create the produce Robert had dreamed of. The Ashton Classic Double Magnum is made with tobacco from the Dominican Republic, lovingly tended at the Fuente facility. That tobacco is then aged for three to five years to perfect the flavor, then hand-wrapped at the Fuente facility in a Connecticut Shade wrapper to produce the Ashton Classic Double Magnum. 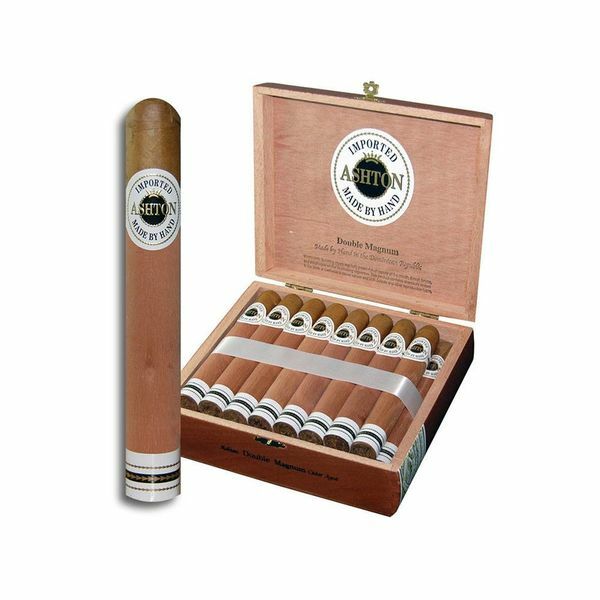 A toro cigar, 6 inches long and with a 50 ring gauge, the Ashton Classic Double Magnum is a mild cigar that is approachable for anyone, but complex enough to enthrall the seasoned cigar smoker. The flavor is best described as rich, and the cigar produces a scent best described as toasty. There are hints of cashew and wood, and the cigar leaves a lingering spicy taste on the tongue when it’s finished. A fantastic smoke for sharing with friends or for enjoying in solitude, and one with consistent and delicious flavor.